The Maritime Archaeological and Historical Society (MAHS) is organized for the purpose of enhancing public awareness and fostering appreciation for the significance of historic shipwrecks and other underwater cultural heritage. Our mission is to preserve our maritime heritage, and our members volunteer to participate in underwater archaeology expeditions around the world. MAHS Meets Bi-Monthly - You're invited! 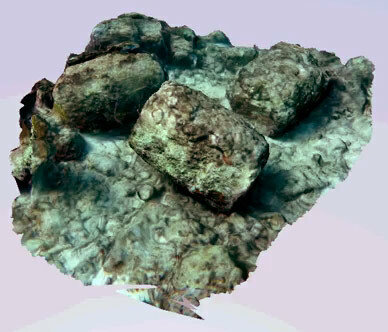 Dave Shaw will be discuss aspects of 3-D Photogrammetry for underwater archaeology. The image to the right is of barrel casts from the Pickles Reef site, in the Florida Keys National Marine Sanctuary, taken by Corey Malcom of the Key West Maritime Historical Society. Join us, Tuesday, April 9, at 7:30 PM at McLean High School. The public is invited. Selected back issues of MAHSNEWS, the official MAHS newsletter, have been placed on the web site in downloadable PDF format. Click here or click on "Newsletter" in the navigation column to the left to access a list of available issues.